Although most of the buzz at the Adobe Summit was not about Adobe Campaign Classic or this year’s latest version of Adobe Campaign Standard (ACS), there were still some interesting sessions regarding these fundamental pillars of Adobe Marketing Cloud and Cross-Channel Orchestration. The Forrester Wave™, Cross-Channel Campaign Management, Q1 2018 research report was published before the Adobe Summit. Once again Adobe Campaign was one of the leaders in Cross-Channel Campaign Management. It’s fair to say that this solution has proven its place and performance. As mentioned in the Forrester report “Adobe blends its solid data and audience management capabilities with marketer-friendly, content-rich CCCM design and orchestration tools.” Adobe is consolidating UX and workflow features across the Adobe Campaign Classic and Adobe Campaign Standard. 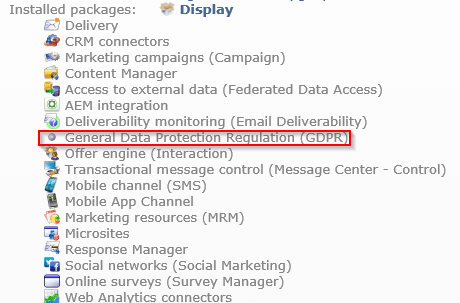 GDPR is not forgotten, and a new Privacy tool package has been released in the second quarter of this year, for both ACS and ACC. Especially ACS is now under development, and more features are coming to this solution soon. From the solution point of view, ACS is taking its place as a marketer’s tool for cross-channel orchestration, journey planning and creating content. ACS creative side has improved all the time with integrations to Adobe Dreamweaver and Adobe Experience Manager, and also email content creation has become simple with no coding required. Adobe Campaign Standard was first launched with an email channel only, but nowadays channel mix in ACS is covering most of the important (email, direct mail, landing pages, mobile push and SMS), it has also capabilities for transactional messaging. During this years’ Summit there were a few breakout sessions covering this topic. The one that caught our eye was ‘EM10 – GDPR & Adobe Campaign: Reducing anxiety when dealing with privacy’ presented by Eric Perrin and Matt Rawding at Adobe, which included a demo of the new ACC package handling Data Subject requests on Access and Deletion of data. For on-premise instances, or ‘out-of-date’ hosted builds, head to for more information on package deployment. When deployed the package adds two folders under ‘Platform’, ‘Privacy Requests’ and ‘Namespaces’. Under namespaces one configures the explicit requests that should be made available, the options to set are which target dimension should be used and what reconciliation key should be used to fetch an entry. Under the folder Privacy requests, Access and Delete requests can be created manually or through API call (press read more under ‘Right to Access and Right to be Forgotten). Then there are three workflows located under ‘Technical workflows’ which maintain the privacy requests. The one I mention here, though briefly, is ‘Collect privacy requests’ that by default is scheduled to run once a day to collect and package any XML file containing the data that has been requested. Custom-created tables linked to the Recipient table will also be exported. Summit was once again a great event to take an overall look of what is going on around Adobe tools and to meet Adobe experts, clients and other marketeers. Because of our background and experience as “Adobe Campaign guys”, we focused on the AC part in our Summit summary. Also, to remember the importance of this marketing automation backbone. It is expected to see more ACS solutions implemented in the Nordics in the near future. For those already working with AC, we’ll provide more detail information about GDPR and the new privacy package. There are more Summit-related blog posts to come, stay tuned!